It may seem like a little bit of a cheat for the first Strong Female Character Friday of Black History Month to be about a character who really isn't African-American technically speaking. And that's true. Steven Universe's Garnet is not African-American. She's an alien, one of the Crystal Gems, who is functionally immortal, thousands of years old, and lives in the small town of Beach City so that she and her friends can protect the Earth from alien threats. So, strictly speaking, not technically black. She's more of a dark fuchsia. But there is a very good reason to talk about Garnet and characters like her during Black History Month. Simply put, while Garnet is not actually African-American, we are meant to read her character that way. She was intentionally designed and cast so as to appear like a black woman. It's no accident that her voice actress is the noted British singer-songwriter Estelle, a prominent black woman. It's no accident that Garnet's character design gives her what appears to be a shaped afro and traditionally African facial features. They didn't whoops into making her, is what I'm saying. We're meant to look at Garnet and think of her as a black woman, and that's a great thing. It's great because in our culture, black is rarely if ever seen as the "default setting". When we're told to just imagine a person, our culture tends to assume said person is white. As in, you're white unless specified otherwise. This is frustrating in and of itself, but it gets worse when extrapolated into storytelling. In science fiction in particular, this unconscious bias means that most aliens are "white" or white appearing, meaning that this standard is reinforced and people of color are given fewer avenues in which to see themselves as the heroes. In other words, Garnet is great because she's an alien who just so happens to look like a black woman and it's no big deal. That's just what she looks like. She's cool and powerful and strong and interesting and also visually identified as being of African descent. That's what I'm getting at here. For those of you who don't watch Steven Universe, though, I'll back up and give you some context. Steven Universe is a lovely Cartoon Network show about a little boy, Steven (Zach Callison), and his three guardians, all of whom are special magic aliens who protect the Earth. 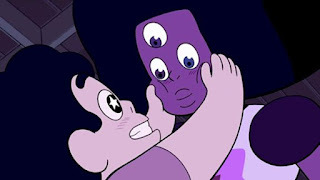 Steven's mother was also one of these aliens, called Crystal Gems, so he is part alien and has inherited his mother's powers. He's raised partly by his human father, Greg Universe, and partly by the Crystal Gems, who teach him how to use his powers for good and how to become the superhero he was always meant to be. It's a very sweet show. Each of Steven's "mothers" has her own distinct personality and powers - Pearl (Deedee Magno) is a precision fighter and brilliant scientist who also hates things being messy and probably fits our most stereotypical idea of what a mom should be; Amethyst (Michaela Dietz) is wild and chaotic with a fighting style to match, preferring to hoard piles of literal garbage and do whatever she feels like whenever she feels like it, making her more of a big sister than mom; and Garnet (Estelle) is the strongest physical fighter of the group, also the most mature, but with a wry sense of humor and deadpan delivery that makes her incredibly memorable. Given their differences, it's not shocking to learn that the Gems work best when their strengths compliment each other and give Steven a really supportive and nurturing home life. But then again, sometimes they clash and everything is a mess. Back to Garnet, it's worth talking a little bit about her background here so we can discuss why her status as a coded African-American woman is so important. Garnet is a little different from the other Gems, a fact that is implied early on but we don't really come to know fully until the end of season one. Namely, Garnet isn't exactly one Gem, she's two. She's the fusion of Ruby (Charlyne Yi) and Sapphire (Erica Luttrell), meaning that Garnet is her own person, sort of, but she's also the physical manifestation or the relationship and love between Ruby and Sapphire. Complicating matters even further is the fact that Ruby and Sapphire's fusion, the fact that their relationship is so stable and strong so as to create Garnet for thousands of years, is incredibly rare. The other Gems who don't live on Earth view Garnet as an oddity at best and an abomination at worst. It's weird to them how Garnet is going around and functioning all the time, even though we the audience, having been with Garnet since the beginning, see nothing out of the ordinary. I mention all of this because it's relevant backstory for the character, but also because it adds more complexity to her character and more diversity to the representation of African-American woman this show is creating. See, Garnet is presented from the beginning as being above all stable. She's so stable. She's the stablest. And this is not a characterization of black women that we're actually used to seeing. Black women are more typically portrayed in the media as being emotionally unstable or volatile, or else "strong black women" who can never break and feel emotion and have weak moments. Garnet is neither of these stereotypes. She's very calm most of the time, with a sort of understated personality, but that doesn't mean she doesn't have feelings. She can be angry or sad or happy or whatever without falling into these character tropes about "mad black women". 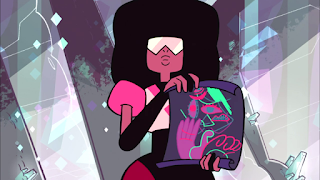 She's just Garnet, wholly herself, a character with enough development to stand up against any external definitions. 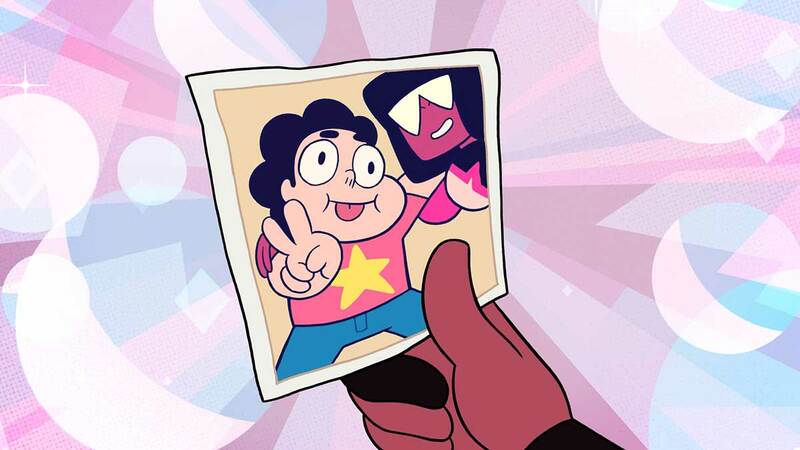 I also want to look at Garnet's relationship with Steven, which tends to contradict the usual stereotypes about black women and their children. While Steven is not biologically her child, it's inarguable that Garnet cares for him and sees him as her own. It is then noteworthy that Garnet as mother is very different from the trite ways that the media commonly portrays black mothers. She's not overtly affectionate, but Garnet is very happy to be silly with Steven. She cares about him so much, but she also makes sure to let him off his leash to play and have fun and be a little boy. She worries too, but she trusts Steven to make the right decisions. In other words, Garnet as mother is just as complex as Garnet as person, a fact that I find really wonderful when I look out at the landscape of overly simplified characterizations and racist shorthand that makes up so much of television. Again, though, I have to come back to how Garnet is an alien who physically presents as African-American, because I think that's really the key takeaway today. Garnet's physical coding as a black woman creates the idea of intergalactic diversity. The concept that aliens, like humans, have a wide variety of forms and all of them are beautiful. 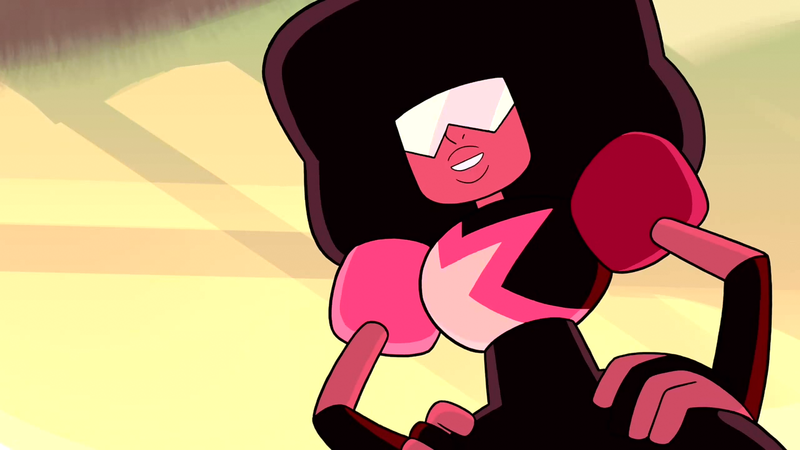 Logically speaking, no, there's no reason why Garnet should look like a black woman. But neither is there any reason for her to look like a white woman or an Asian woman or so on. 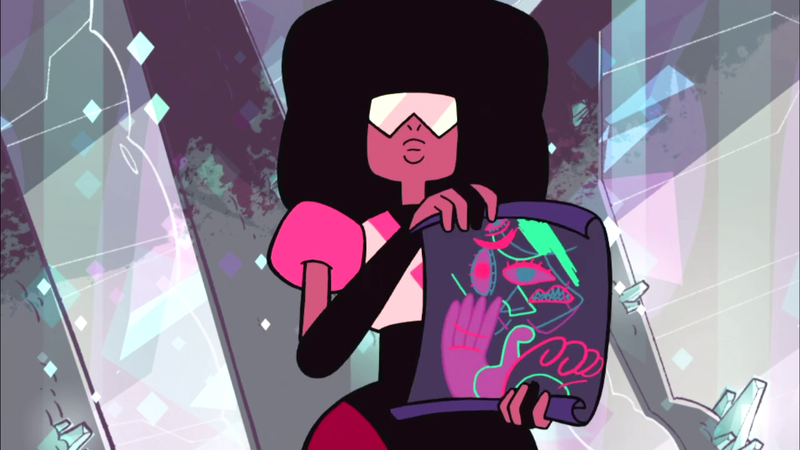 By making Garnet physically appear African-American, the show opens up the idea of what the "default" can be. By that I mean that Garnet's appearance and intentional casting is a way for the show to signify that black people matter. Making this badass, deadpan snarker of a alien look like a black woman is a way to expand the conversation on what and who black women can be. Garnet's physical presence is entirely irrelevant in the story, but it's massively important to us in the audience. That's all I'm getting at. Garnet is beautiful and funny and strong and an expression of pure love, the kind of person we all kind of want to grow up to be. I don't think it's an accident that the minds behind Steven Universe chose to make her look the way she does, and I'm incredibly grateful that they did. I'm a little late to this party, but I love this blog post. 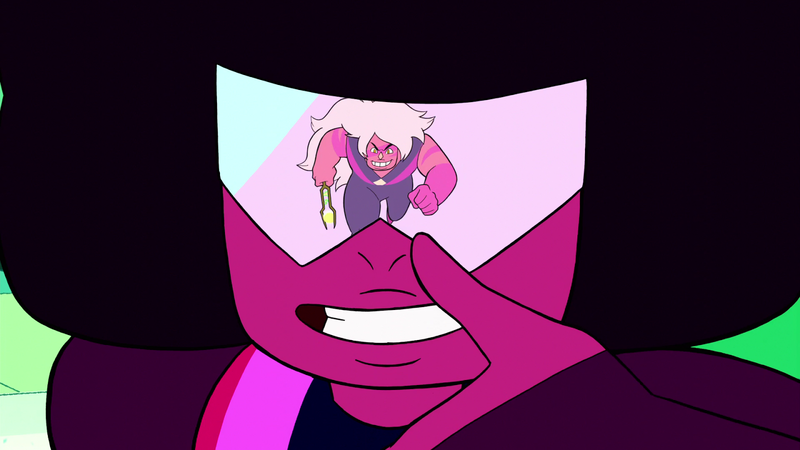 Stumbled on it during a Google search for Garnet images. Well said.